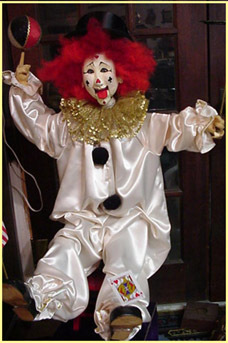 This clown was from the old MGM Grand hotel, but was in the fire. His face was originally latex, that didn't survive the fire. I made him a paper mache face and Dallas figured out how to restore his orginal actions. He teeters on a chair, moves both legs, balances a flag on one foot, a card on the other, spins a plate on a rod in one hand, and spins a ball on a finger with the other. He moves his head from side to side, his eyes also move from side to side. His mouth opens and he sticks his tongue out. Instead of a clock wound mechanism , he is powered by electricity. This French piece is a tambourine-playing clown by Lambert circa 1880's. 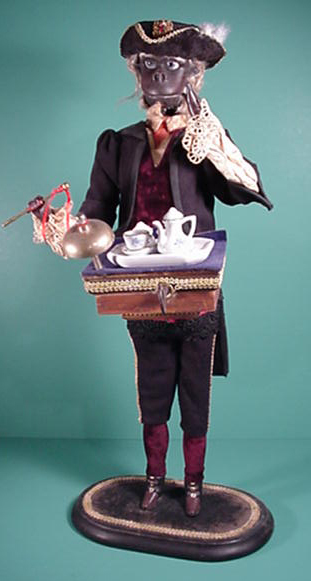 The music box plays, clown looks around, raises and lowers left arm while playing the tambourine with the right arm. He is 22" tall. French, Le Chat (the cat) by DeCamps circa 1880's. 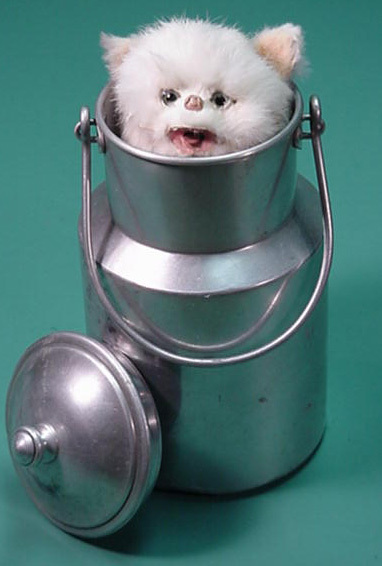 It has music and the cat comes up from the bottom of the milk can, turns his head, licks his lips and pops back down! 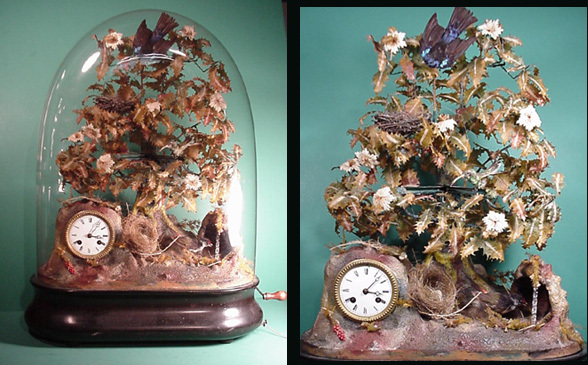 This piece was made by the French automata maker, Phalibois. Circa 1880. 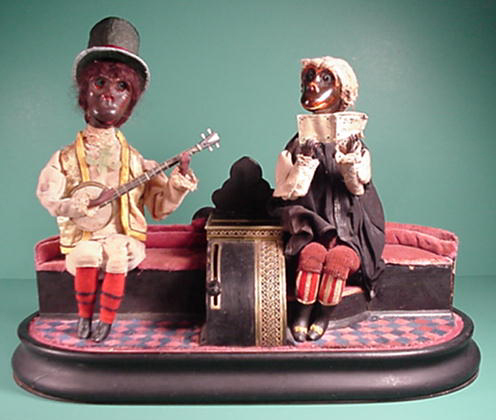 It has a music box, and the male monkey strums the banjo and keeps time with his head, while the female reads the music and turns to look at the banjo player. It's base is 18.5" x 7.5" and it is 13.75" high. This is an original piece made by the French maker, Bontems. It works by means of clockwork and bellows. The hummingbird in the center right flys from one branch to another and the bird at the bottom right corner drinks from a waterfall while the birds chirp. The clock keeps good time, chiming on the half hour and hour. There is a music box in the base. 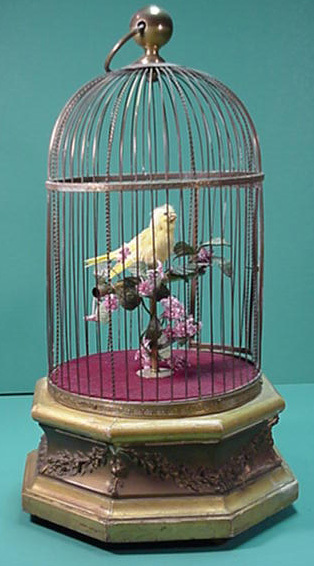 Bontems took one of these creations to the London Exposition in 1851. It is 20" w x 24.5"